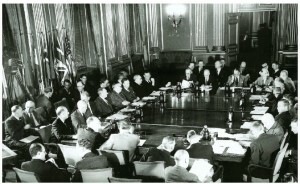 Canada played a prominent role in NATO’s founding meeting in 1949. First in a four-part series on the 70th anniversary of the North Atlantic Treaty Organization. With NATO turning 70 next week it’s a good occasion to revisit the creation of a military alliance operating under the stated principle that an “attack against one ally is considered as an attack against all allies.” Now encompassing 29 member states, the north Atlantic alliance was instigated by US, British and Canadian officials. Formally, NATO was the West’s response to an aggressive Soviet Union, but the notion that the US, or even Western Europe, was threatened by the Soviet Union after World War II is laughable. Twenty-five million people in the Soviet Union lost their lives in the war while the US came out of WWII much stronger than when they entered it. After the destruction of WWII, the Soviets were not interested in fighting the US and its allies, which Canadian and US officials admitted privately. In April 1945 Canada’s ambassador to Russia, Dana Wilgress, concluded that “the interests of the Soviet privileged class are bound up with the maintenance of a long period of peace.” The Soviet elite, the ambassador continued in an internal memo, was “fearful of the possibility of attack from abroad” and “obsessed with problems of security.” Wilgress believed the Soviets wanted a post-war alliance with the UK to guarantee peace in Europe (with a Soviet sphere in the East and a UK-led West.) Internally, US officials came to similar conclusions. Rather than a defence against possible Russian attack, NATO was partly conceived as a reaction to growing socialist sentiment in Western Europe. During WWII self-described communists opposed Mussolini in Italy, fought the fascists in Greece and resisted the Nazi occupation of France. As a result, they had a great deal of prestige after the war, unlike the wealth-holders and church officials who backed the fascists. If not for US/British interference, communists, without Moscow’s support, would probably have taken power in Greece and won the 1948 election in Italy. In France the Communist Party won 30 percent of the first post-war vote, filling a number of ministries in a coalition government. Informally known as “Operation Gladio”, these right- wing “stay behind” groups were overseen by NATO’s Office of Security. A Spanish paper reported, in November 1990, “The Supreme Headquarters Allied Powers, Europe (SHAPE), directing organ of NATO’s military apparatus, coordinated the actions of Gladio, according to the revelations of Gladio Secretary General Manfred Wörner during a reunion with the NATO ambassadors of the 16 allied nations.” At the time the European Parliament condemned Operation Gladio and requested an investigation, which hasn’t been undertaken. Canada was one of two NATO countries omitted from Daniele Ganser’s NATO’s Secret Armies (Iceland was the other). 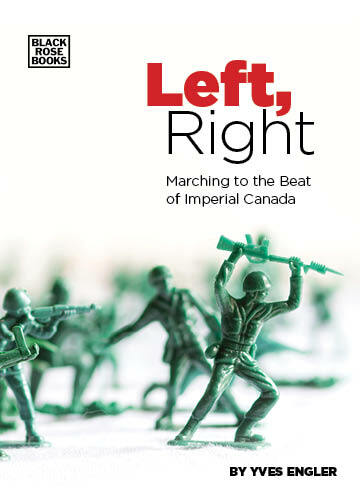 No researcher has tied the two together, but the year after NATO was established the RCMP began a highly secretive espionage operation and internment plan known as PROFUNC (PROminent FUNCtionaries of the Communist Party). In October 2010 CBC’s Fifth Estate and Radio-Canada’s Enquête aired shows on “this secret contingency plan, called PROFUNC, [which] allowed police to round up and indefinitely detain Canadians believed to be Communist sympathizers.” In case of a “national security” threat up to 16,000 suspected communists and 50,000 sympathizers were to be apprehended and interned in one of eight camps across the country. Initiated by RCMP Commissioner Stuart Taylor Wood in 1950, the plan continued until 1983. Blunting the European Left was an important part of the establishment of NATO. As odes to the organization ring across the dominant media during this week’s 70thcelebrations, it’s important to remember that NATO was birthed with an elitist, anti-democratic intent. Its reason for creation was to manage “democracy” so that existing elites maintained their status.